I have a new favorite canning book! Ball Blue Book and Putting Food By have been my go-tos for years, but if I could only choose one, I think it would be Daisy Luther's The Prepper's Canning Guide: Affordably Stockpile a Livesaving Supply of Nutritious, Delicious, Shelf-Stable Foods. Seriously, it covers everything from beginner basics to advanced designer canning recipes, and all with a preparedness mindset. 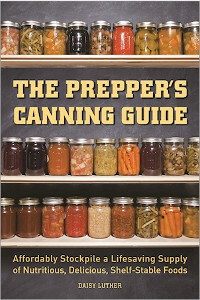 Part 1: Canning Basics for the Prepper includes an introduction and covers canning how-to basics. One thing the author points out, is that many of the foods we commonly store as part of our preparedness plan take a long time to cook - grains and legumes for example. This can mean cutting into precious water and fuel stores just to prepare a meal. By including a variety of canned items in one's food storage, we can have quicker meals incorporating a larger variety of foods prepared the way we're accustomed to. Meat is another example. If the grid goes down and one doesn't have electricity, then the freezer is no longer a storage option. If you like to eat meat, consider learning to can it. Part 1 also covers canning safety, tips for thrifty canning, off-grid canning, equipment, plus gives you step-by-step instructions for both water bath and pressure canning. Homegrown, home-canned black turtle beans. I've been wanting to learn how to do this. Easy! BBQ Beans are next on my to-try list. Part 3: Dinner Is in the Jar. Now that's what I'm talkin' about - real convenience food. Preparedness aside, I have to admit that after a long day of working outdoors, nothing is nicer than a quick healthy home-cooked meal in a jar. Nothing to defrost, just heat and serve. First on my list to try are the Cajun Jambalaya and Apple-Spiced Pork Chops. Also covered in part three are how to use leftovers for canning and a chapter on creative canning. This one gives you guidelines for canning your own recipes safely. There are a number of really helpful charts throughout the book, but I very much like that these are also found in the appendix. That means I don't have to do a lot of page flipping to find what I'm looking for. What more can I say except "Highly recommended." Sprouting grain for my goats was something I first experimented with when I was preparing to write How To Garden for Goats: gardening, foraging, small-scale grain and hay, & more. Sprouting their grain is a nutritious way to stretch the grain budget, whether one is purchasing grain or growing one's own. I continued until the weather got too hot and had trouble managing the project. My sprouts started to smell bad no matter how often I rinsed them. bowl holds one days-worth of grain for my goats. All that has proven great for monogastric humans, but what does it do for ruminants, i.e., multi-stomached goats? Especially the sugars. Goats' digestive systems are designed to extract nutrients from roughage. The longer digestion times allow for the breakdown of cellulose into simpler carbohydrates they can assimilate. Grains, which break down quickly, end sitting in their gut so long that they begin to ferment and become acidic - not healthy for the goat and why most goat owners offer free choice baking soda to their goats. I do feed small amounts of grain, especially when there is little forage available, or for does in milk who need the extra calories. The does in milk get one pound of grain twice a day (with one quarter of that being wheat bran); dry does and bucks are currently get half that amount. I feed our homegrown grains as hay, i.e. it isn't threshed but still in the stalk. I think this is the healthiest way to feed grain, because the goat gets the long stem part of it as well which aids in digestion. Chaffhaye, bran, sprouted grain, sunflower seeds, & chopped carrots. Back to sprouting. I can't help but wonder how sprouted grains digest in the rumen, but can't find any answers. Most other blog posts or web pages on sprouting grain for goats say the same thing I've told you, but there doesn't seem to be any information out there specifically on that. One thing sprouters do agree on, is that it only takes about half the sprouted grain as it does non-sprouted. I've found that to be true as well. So cutting down on that feed bill is a good reason to sprout. At least during winter when the temperature isn't too hot. I'll have to wait to see how it goes this summer. If we have too much heat and humidity to keep the sprouts fresh, I'll just save it for winter feed. Would you be interested in an online solar cooking class hosted by me? Lini with her bucklings Conner (purple coat) and Jack. After January's snow our weather turned mild and with just enough rain to get things growing. Then came March. We've had a few nice days but also snow, hail, sleet, heavy winds, and icy temperatures. Looking on the bright side, it has meant all my knitting was not in vain. The only trouble is, the kids have almost outgrown their baby goat coats! so the kids can reach the minerals as well as the adults. Windy. She's managed to wiggle her way out of three coats! Sleeping pile in the sun. Cuddle up with your Maa (Windy and Violet). At least they still fit, which is good because some of them are being separated at night so that I can milk their mothers in the morning. But I can also see where I'll need to make pattern adjustments in future coats. Last time I showed you my latest hedgerow project; this post I'll show you our other outdoor winter projects - pasture and grain-growing. We live in a mild enough climate so that most winters we can have winter pasture as well as summer forage. Last summer was so hot and dry, however, that I was late in planting. I like to plant cool weather forage in September and October, but I postponed planting until the rains started to come. You might recall this photo from a post at the end of last December. We've had enough rainfall and mild days to get good growth. introduced to fresh new pasture slowly to let their rumens to adjust. I also planted two areas for the bucks. and winter peas from the feed store, just starting to grow. Do you see how the grass is growing in rows? Dan disced, but it should have been leveled too, so that all the seed didn't roll into the little furrows. If the soil is bare then I just toss the seed directly onto the ground. This is good for spot seeding and also larger areas. I plan the plantings for when I need to muck out the barn. We don't have a seed drill so I hand broadcast it and if I can, cover it with barn cleanings. with straw, hay, & manure from the goat barns. The straw and hay from the barn covers the seed and the manure helps it decompose plus adds nitrogen to the soil. After a couple of rains these seeds are sprouting and grass is growing. A picture like this always looks so pretty to me! On to grain. Every year we try to plant about a quarter-acre of field corn. This year we're moving that location to a spot that is not prone to blackberries and morning glories. Dan prepped the soil and I planted with the same pasture seed as a green manure crop. Sprouting wheat, peas, and oats will become green manure. Green manure is a cover crop that is tilled into the soil while it is still young and green. It adds both nitrogen and organic matter to the soil. Our winter wheat is coming along as well. Right now it just looks like grass, but soon it will begin to grow. It's called winter wheat because it's planted in the fall and harvested in spring. Summer wheat is planted in spring for a summer harvest. Once it's harvested I'll plant it back to pasture.